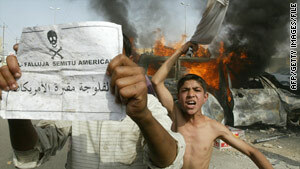 Iraqis taunt U.S. forces with a leaflet reading, "Falluja: Cemetery for Americans" in March 2004. Norfolk, Virginia (CNN) -- The military judge in the court martial of a Navy SEAL accused of abusing an al Qaeda suspect denied a motion Monday to introduce what the defense said was evidence of unlawful command influence. Navy Capt. Moira Modzelewski, presiding over the first day of the trial of Petty Officer 2nd Class Matthew McCabe, said she saw no evidence that Maj. Gen. Charles Cleveland, who decided to take the case to court martial, had been pressured. Modzelewski granted another defense motion, to require a second interpreter to translate the Iraqi detainee's deposition. The defense says there are discrepancies with the original translation. McCabe is the last of three SEALS accused of abusing Ahmed Hashim Abed, who was arrested in Iraq in September and charged with orchestrating the slayings of four U.S. contractors in Falluja, Iraq, in 2004. The killings got widespread news coverage when the burned bodies of two of the contractors were paraded through Falluja's streets and hanged from a bridge as their captors cheered. McCabe is charged with punching Abed in the stomach. He is also accused of dereliction of duty and lying to investigators. The military had charged Petty Officer 1st Class Julio Huertas and Petty Officer 2nd Class Jonathan Keefe with dereliction of duty based on allegations that they failed to safeguard the prisoner. Huertas had also been charged with impeding an investigation by attempting to influence the testimony of another sailor. Both were found not guilty in courts martial last month. The case against the SEALs has sparked protests and online petitions from many who argue that the U.S. military is going overboard to protect the rights of an alleged terrorist accused of plotting to kill Americans, taking his word over that of U.S. troops. About 50 protesters gathered Monday outside the gates of Norfolk Naval Station to demonstrate their support of McCabe. Dozens of lawmakers, mostly Republicans, have signed letters to Defense Secretary Robert Gates asking him to intervene in the case. In March at a press conference, Rep. Dana Rohrabacher, R-California, appealed to the Pentagon to drop the charges against the Navy commandos. "These Navy SEALs were apprehending a terrorist murderer and they are being accused of roughing him up? Give me a break. These men should be given medals, not prosecuted. These men are heroes," said Rohrabacher. Cleveland, the Central Command Special Operations commander and the convening authority in all three cases, responded to a congressional inquiry by Rep. Dan Burton, R-Indiana, in a letter in December, saying the military had "reasonable grounds to believe that an offense had been committed," not based solely on the detainee's accusations but also on allegations "raised by other U.S. service members." "The abuse of a detainee, no mater how minor, creates strategic repercussions that harm our nation's security and ultimately costs the lives of U.S. citizens," Cleveland wrote. McCabe's defense had moved to include what it said was evidence that Cleveland was pressured to take the case to court martial, citing a television program transcript. In that transcript, a reporter said he spoke with someone "very close" to Cleveland who said the general had offered McCabe nonjudicial punishment because he didn't want the case to go to court martial. The reporter said that Cleveland was pressured to proceed with the court-martial rather than dismiss the charges after McCabe elected to fight the charges in trial. Modzelewski ruled that there was no evidence of any pressure and that the reporter's claims amounted to speculation.